Many years ago, Before Kids, I worked as an Environmental Educator for a local parks department. We worked at the beaches and in a forested park, leading groups of children and adults, spring through fall, on field trips and nature discovery programs. We would have several activities to guide children to learn more about the natural environment around us. I learned a ton during those years, and enjoyed my job for the most part. But one thing bothered me: it was difficult in such a structured environment to leave kids with a sense of wonder. 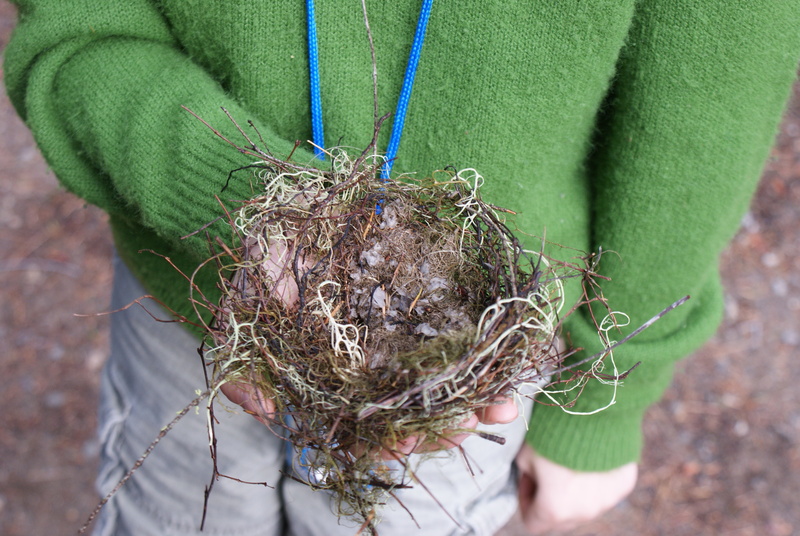 A bird nest the kids found. They wanted to keep it. I said no, but let them observe it and make their own nests from found materials to bring home. During that time, I was allowed to go to an environmental education conference down in Portland for a weekend. One of the presenters was the marvelous Joseph Cornell, who has written several books about sharing nature with children in an immersive and even magical way. He led us through a series of exercises based on his theory of how to encourage kids and adults to reach a state of sensitive, creative awareness. Even in that dry hotel conference area, with a minimum amount of city nature outside, we all were able to observe something new and interesting, and came away with a feeling of peace and curiosity. Since then I’ve come across teachings of other educators, such as Jon Young, who follow in a similar pattern of immersing kids in nature and letting them come up with discoveries that spark something inside of them. Finding different colors and types of soil to make pretend medicine and food. When I came back to my programs I led for the kids in our area, I became frustrated by the disconnect. We took kids out for a walk, tried to teach them some things, and then they were gone, back to their schools and city homes. Where was the magic? Why couldn’t we focus on instilling a sense of wonder and amazement that would lead these kids and their parents to want to come back again on their own, to find out more on their own time? 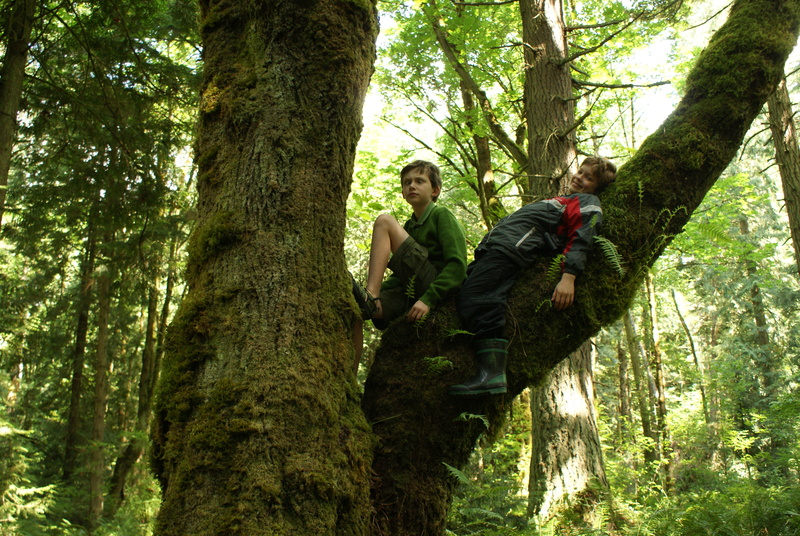 When I had my own kids, we naturally spent as much time as we could outside, in the wild and in our own backyard. 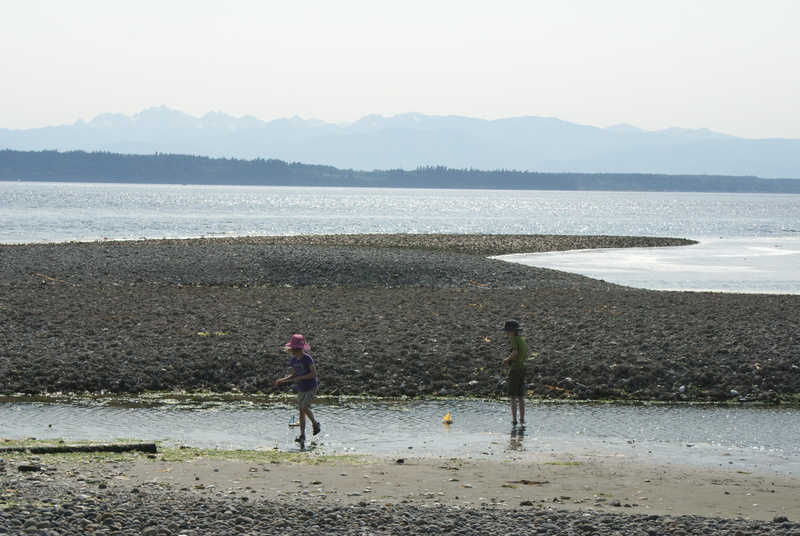 I try to let my kids explore without too many structured activities. I let them pick up bugs and frogs, even snakes and lizards. Yes, my daughter might have played with a frog too long as a 5-year-old on a hot day, and my son might have gotten nicked from a snake’s fangs. This poor frog was kind of hot. Annika learned first hand that frogs don’t like to be played with for hours, and that they need cool water and shade to live in. I don’t do a lot of formal nature teaching with my own kids. They have an innate desire to learn more. We have an overabundance of field guides and ecological books we can turn to for more information when something strikes their fancy. When Annika wants to pretend to be a different kind of bird, she pulls out the Peterson Field Guide, finds a bird that looks like what she has in mind, tries to read the name, or gets help if she can’t, asks questions about where it lives and what it eats, if she cares, and goes off to play. 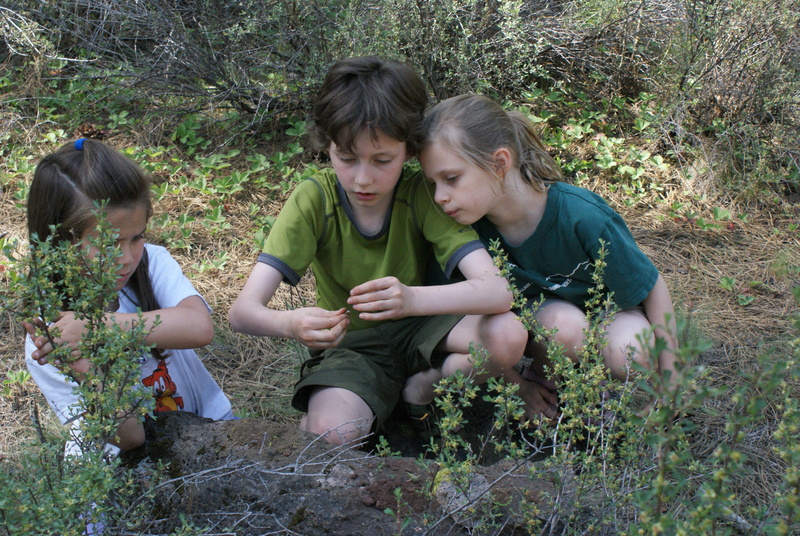 Our shared experiences in nature over time have gradually built up a pretty thorough knowledge for my kids about native plants, insects, amphibians and reptiles, birds, even weather, geology and geography. Just by going out and letting them roam, giving them the gift of free time and space to explore, we are encouraging them to learn, to find the magic of nature. Then, when they are older, they can decide for themselves how much they want to invest in protecting the land they care for. They will be more likely to work for protection of the natural world if they love it, know it, and have a deep inner connection to it. I came across an article this morning that speaks much more eloquently than I did to this same issue. OutsideMom.com shared it on her Facebook page. It’s an Orion article on their website called “Look, Don’t Touch: The Problem with Environmental Education” by David Sobel. I encourage you to take the time to go and read it, and I’d love to hear your thoughts. 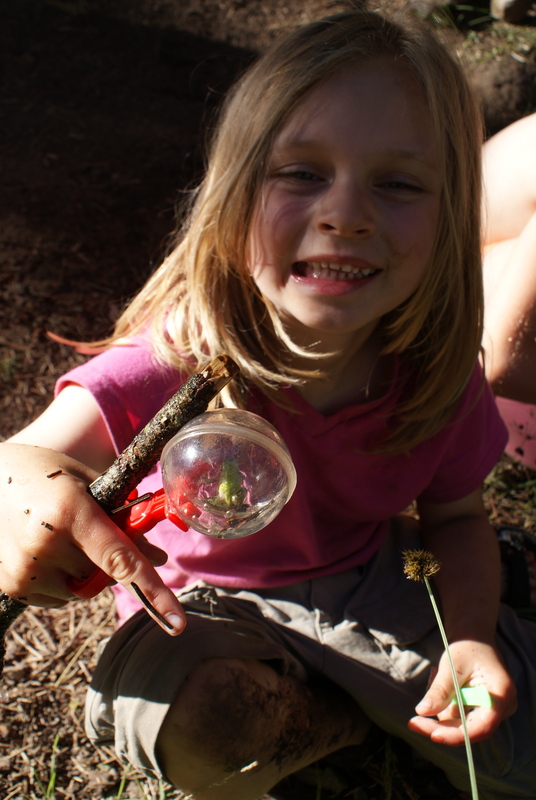 Do you work in environmental education with children? Have you noticed the same things I did? 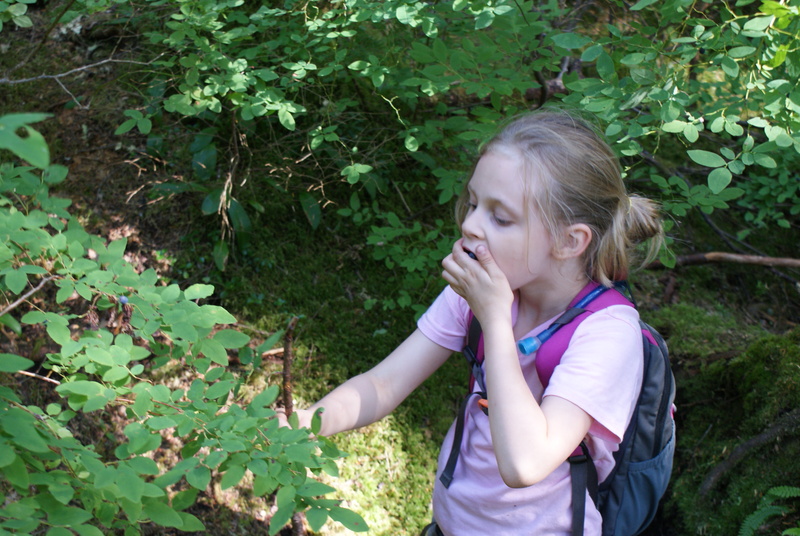 Do you have kids that you are teaching about nature? What have you noticed about encouraging them to love and learn about the natural world? Let me know in the comments. Good article, Hiker Mama. I found a path to your blog via the recent posting on nwhikers.net from the dad who wanted feedback from others about hiking with babies (I’m a stay-at-home dad in Seattle…..5.5 years and 10 month old boys). Thanks for stopping by! I hope you can find some useful information as you get out with your kids. Between ages 5 and 6 is when my kids really started to be able to hike longer distances with less whining!